South San Francisco-based Sanrio Inc. will sell tote bags and t-shirts to raise money for Japan relief. Hello Kitty, an animated character from Japan, has been enlisted to help raise money for her earthquake-ravaged homeland. 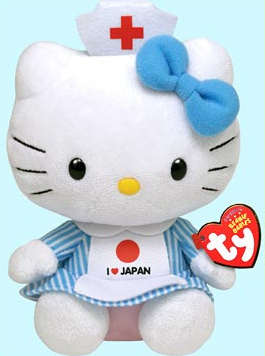 South San Francisco-based Sanrio Inc, the North American subsidiary of Hello Kitty’s parent company Sanrio Co., has teamed up with the Ty, maker of the Beanie Baby, to create a Hello Kitty plush toy dressed wearing a shirt that says I LOVE JAPAN that will retail for $5.99 to $7.99. Ty has pledged a $1 million to the American Red Cross to boost Japan relief efforts. 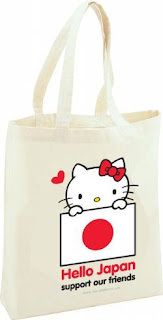 Sanrio Inc. is also producing a tote bag that will sell for $10 and t-shirt for $20 that read “Hello Japan,” of which a portion will go toward relief efforts. Those items will be available later this month at Sanrio boutiques and sanrio.com. Sanrio Inc. also has links on its web site to donate directly to the American Red Cross. So far, Sanrio's site has funneled more than $50,000 in donations. Tokyo-based Sanrio Co. is celebrating its 50th anniversary this year. Besides Hello Kitty, its products feature other characters including Keroppi, Chococat and Badtz-Maru. The South San Francisco headquarters of Sanrio Inc. has approximately 80 employees and oversees distribution for Sanrio stores and wholesale accounts in the United States and Latin America. I LOVE These Hello Kitty Japan Relief Items!